The president was asked whether he thinks he should get the Nobel Prize for his peace efforts. "Everyone thinks so," he responded. 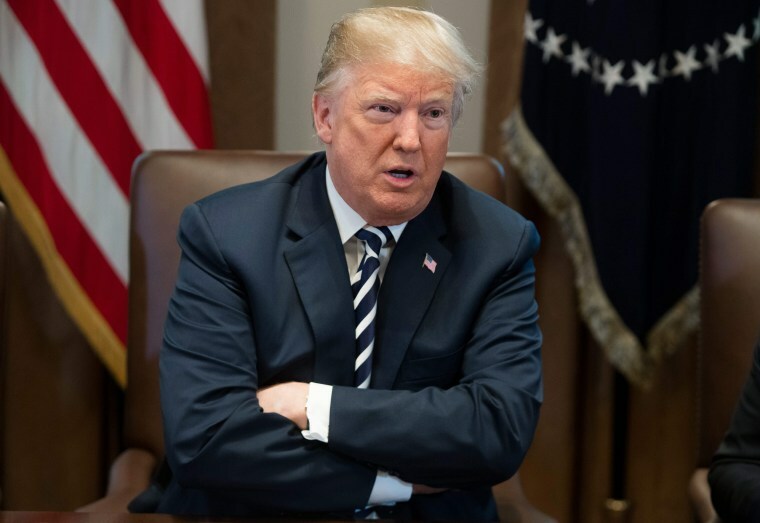 WASHINGTON — President Donald Trump said Wednesday that the demilitarized zone between North Korea and South Korea won't be the site of an upcoming nuclear summit. "It will not be there," Trump told reporters before a Cabinet meeting at the White House, adding that the time and place of his historic meeting with North Korean leader Kim Jong-un will be announced "within three days." Trump, who had previously raised the prospect of using the DMZ as a summit site, spoke as his secretary of State, Mike Pompeo, traveled back to the United States from North Korea with three Americans who were released from detainment — Kim Hak-song, Kim Dong-chul and Kim Sang-duk. South Korean media have reported that the summit will take place in Singapore. Other possible locations that have been floated include European sites such as Switzerland. U.S. efforts to convince Kim to give up his nuclear capabilities come against the backdrop of Trump announcing Tuesday that he would restore Iran sanctions that had been suspended under a deal to freeze Tehran's nuclear program. Some of Trump's allies have said that he should be given the Nobel Peace Prize for bringing North Korea to the negotiating table. Trump joked with reporters when asked about that. "Everyone thinks so," he responded when asked if he should get the prize, "but I would never say it." Trump said he wanted a "victory for the world" in North Korea and warned that there's distance between where the parties are now and finalizing an agreement. And it's possible, he cautioned, that even the summit could end up falling through. "Everything can be scuttled," he said. "I think we have a really good chance to make a great deal for the world." But it was hard to ignore that one nuclear-nonproliferation deal appeared to be coming together just as Trump had ripped up another. Critics of his Iran decision fear that Tehran will use the U.S. withdrawal from the multinational pact to justify restarting its nuclear-weapons program. Trump reiterated that that would draw a U.S. response. "If they do," he said, "there will be very severe consequences."